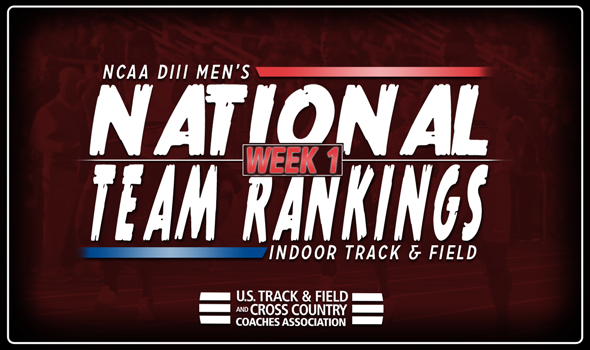 NEW ORLEANS – Nothing remained the same in the top-10 of the NCAA Division III Men’s Indoor Track & Field National Team Computer Rankings from the preseason to Week 1. While nine teams from the top-10 in the preseason are still in the top-10, none of them held steady. That includes former No. 1 UW-La Crosse, which slipped to No. 2. North Central (Ill.) is the new No. 1 team in the land after soaring nine spots from No. 10. This is just the third time in the past three years that the Cardinals have been ranked No. 1. As stated before, the Eagles came in at No. 2, followed by UW-Oshkosh at No. 3, Dubuque at No. 4 and Benedictine (Ill.) at No. 5. North Central (Ill.) surged thanks to the efforts of its distance corps and 4×400 relay team this past weekend. Druvil Patel clocked the second fastest time in the nation over 5000 meters (14:25.69) and four of his teammates – Nolan McKenna, Matthew Norvell, Zach Hird and Dan O’Keefe – aren’t too far behind either. The Cardinals also ran the second fastest time to date in the 4×400 this past weekend (3:18.26). The Titans mainly vaulted two spots from No. 5 to No. 3 because of Devan Gertschen’s outing in what else but the pole vault. Gertschen cleared 4.95m (16-2¾) to move up to third on the NCAA DIII Descending Order List. Ryan Powers still holds the No. 2 spot in the USTFCCCA Individual Rankings when it comes to the 200. Jordan Johnson pushed the Eagles into the top-5 for the 15th time in the past three years with his blistering time in the 60. Johnson neared all-time status when he crossed the finish line in 6.80 and sits atop the NCAA DIII Descending Order List in the event. MIT moved up two spots from No. 8 to No. 6. The Engineers have a lot riding on the legs of Tre Albritten (No. 1 at 200 meters) and Dennis Maloney (No. 1, 3000; No. 3, 5000). If you’re looking for the biggest jumps of the week, look no further than Augustana (lll.) and Bowdoin. The Vikings raided 41 places from No. 65 to No. 24 between the preseason and Week 1 behind a top-ranked 4×400 relay (3:17.60). The Polar Bears went from No. 35 to No. 19 after Brian Greenberg (triple jump) and Sean MacDonald (3000) moved into the top-10 of their respective events. Be sure to check back throughout the season as a lot will continue to change in advance of the NCAA Division III Indoor Track & Field Championships, which will be held from March 9-10 in Birmingham, Alabama.